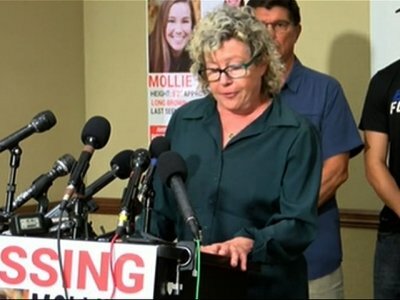 Laura Calderwood said during a news conference that she believes her daughter, 20-year-old Mollie Tibbetts, is alive but has potentially been kidnapped. She also announced the new reward amount, which spiked from $2,000 offered earlier this week after donations poured in from across the nation. Tibbetts’ disappearance has baffled investigators since she went missing more than two weeks ago. Calderwood said the money would be paid to anyone who provides information that leads to her daughter’s safe return. Tibbetts was last seen on the evening of July 18, when she went for a routine jog in her hometown of Brooklyn, Iowa, a town of about 1,400 people in central Iowa. She was dog-sitting that evening for her boyfriend and her boyfriend’s brother, who were out of town, at a home where she was living this summer after completing her second year at the University of Iowa. Tibbetts was reported missing the next morning when she didn’t show up for work at a daycare in a nearby town. The FBI and dozens of investigators from state and local agencies are working on the case but have so far hit dead ends . The latest came Thursday, when police confirmed that a possible sighting of Tibbetts at a Missouri truck stop turned out not to be her.